A small white doggie with a funny-looking muzzle and pointy ears is far from the image of a fearless trailblazer. However, that’s exactly how the first living being to travel around the planet and return safely looked. Belka and Strelka were two dogs who were onboard the Sputnik-5 spacecraft when it broke into orbit on August 19, 1960, circled the Earth 17 times and returned home. Accompanying them were two lab rats and forty mice, as well as a life support system, instruments and other equipment. The space travelers became instant stars, enjoying media support and later quiet and happy lives. One of Strelka’s pups was sent as a present to the family of US President John Kennedy by Soviet leader Nikita Khrushchev. Yet the story has its closets with dog skeletons in it. Before the duo became space pioneers, 17 of their canine buddies died in accidents, and one was made an unwilling sacrifice to the altar of technological breakthrough. Dogs have been the lab animals of choice for Russian scientists for decades. For example, everyone knows what “Pavlov’s dog” means. The space researchers chose canines for tests as well. The four-legged rocket passengers were caught among strays in Moscow streets – their survival in this environment suggested that they were sturdy enough for space. There were strict limits on size and weight, since every extra kilo or centimeter meant scientists could fit in less equipment. The color had to be white, so that dogs were clearly seen against the dark background of capsules on telemetry. Later, cameramen working with new celebrities approved the decision. Space dogs also had to be calm, friendly and industrious enough to pass many endurance tests without giving humans a bad day. Interestingly, the dogs also had to have proper names. Kennel staff had to rename a Marquise into Belaya to avoid any references to aristocratism. The first-ever “dogged” rocket flight took place on July 22, 1951. An R-1 rocket with dogs called Dezik and Tsygan reached suborbital altitude of more than 87 kilometers during a 15-minute flight. Both passengers were unharmed. Before a dog was delivered into orbit, engineers launched 29 suborbital rockets with dogs onboard. Eight of them had been a failure, and pioneer Dezik died in one of the accidents. The first living being to break Earth’s gravity was Laika, and her story is among the tragic episodes of space exploration. Researchers had to be sure that continuous freefall would not expose some fatal flaw before investing resources into manned spacecraft, and no ground-based experiment could give that answer. Laika was a deliberate sacrifice. Her capsule had only basic life support, and safe return to Earth was never considered, since such technology didn’t exist at the time. She was bound to die an unpleasant death several hours after the launch. Taking a cruel experiment like this into media spotlight was an unwise idea, but that’s exactly what the soviet leadership did, hungry for a new triumph after the launch of Sputnik. On November 2, 1957, Sputnik-2 with Laika onboard was launched, and for several days soviet media was flooded with enquiries on the wellbeing of the dog and reported on its good health. In reality, however, she was already dead. After the technical success and publicity failure with Laika, the Soviet Union didn’t perform any animal launches for three years, over which a capsule capable to return from orbit was developed. The first attempt was made on July 26, 1960. The rocket with dogs Bars and Lisichka (who was Sergey Korolev’s favorite in the space dog team) exploded seconds after takeoff. 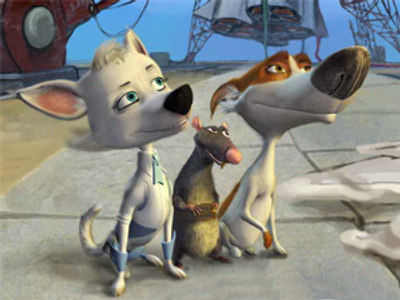 The backup crew of Belka and Strelka took over and became stars. The dogs did well during the flight. While the more cautious Strelka stayed calm, lively Belka played a lot with the weightlessness and barked all the time. Scientists on Earth were sorry that they didn’t fit the capsule with a microphone. Before the first human launch was approved, two spacecraft with a dog and a mannequin onboard had been sent into orbit. Their missions were almost exactly the same as that of Yury Gagarin. With a good deal of irony Gagarin later remarked that he couldn’t make up his mind whether he was the first man in space, or the last dog.